Michigan Audubon has strongly supported Michigan’s protection of the Mourning Dove as a songbird since its inception. The ban started in 1905, just one year after Michigan Audubon — the state’s oldest conservation organization — was formed. The last time a bill was introduced to legalize hunting of doves in Michigan, the proposal was defeated by more than 1.3 million votes. There has historically been an overwhelming public support against dove hunting. Michigan Audubon remains committed to bird conservation and continues to oppose removing protection of this native bird in the state of Michigan. Mourning Doves can very easily be misidentified in flight, which poses a threat to many other birds and the environment. 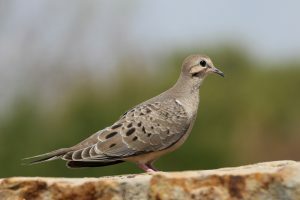 If this bird were classified as a game species, the hunting of Mourning Doves would take place as many other birds are migrating, including hawks, falcons, flickers, and a plethora of songbirds. Many similar-sized birds can be found in the same habitats or exhibiting similar behaviors, like perching on wires or poles, which may result in confusion and accidental death of other protected birds. Mourning Doves do not require population control. Doves are not overpopulated, and there is no evidence that suggests dove hunting is sound wildlife management. On the contrary, the Mourning Dove is often called “the farmer’s friend,” as it poses no threat to crops or homes; it is not a nuisance or a pest, but rather provides benefits to people, the environment, and farms in Michigan. A common seed-eating ground feeder, Mourning Doves consume impressive amounts of weed seeds and waste grains which would otherwise attract rodents. The Mourning Dove nesting season overlaps with the fall hunting season, which may result in orphaned chicks who struggle to survive without their parents’ care. 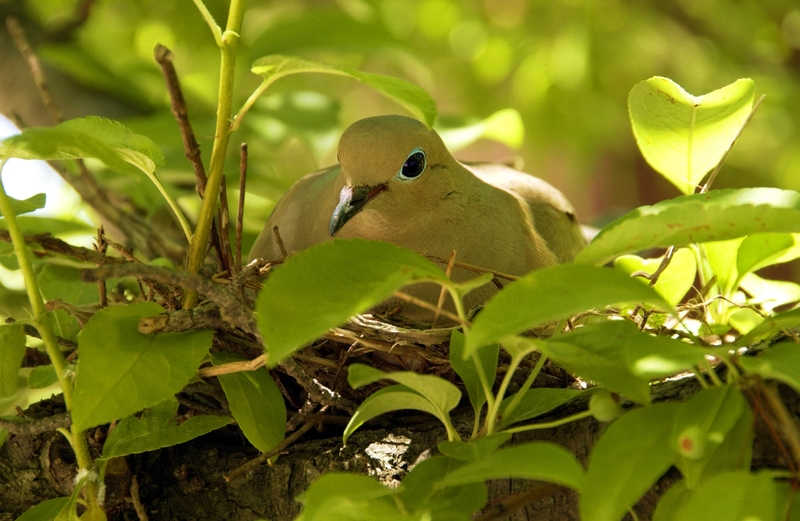 Early Mourning Dove seasons, such as those in other northern states, can result in parent birds being shot while still feeding late-brood nestlings. The Mourning Dove is not a suitable game species. The harvested meat from this bird would be less than one ounce before cooking. It is not fitting to classify this bird as game, as it would provide minimal sustenance. Additionally, the birds’ affinity for perching on phone and power lines makes for a risky shot, and damages to infrastructure, loss of utility services, and safety issues are other contributing factors to how poorly this species fits classification of game. Dove hunting would increase toxins in the environment that could have detrimental ecological effects. Lead is frequently used as ammo in dove hunting, and given the species’ erratic flight behavior, scattered excess shot is likely to accumulate in the environment. Long-term studies have suggested that five to eight gunshot shells must be used for each dove shot and bagged. These scattered lead shots may be consumed by doves themselves or other ground-feeding species. Lead that makes its way into waterways can threaten eagles and diving waterfowl, including Common Loons. Any doves that are not retrieved — a common occurrence — may be scavenged by birds of prey and other wildlife that will indirectly ingest the shot and suffer from lead poisoning. The Mourning Dove is a well-loved backyard bird and provides pleasure to thousands of Michigan bird lovers. People enjoy watching this gentle bird and listening to its cooing song. There are important ethical considerations to make regarding hunting Mourning Doves. In other states, studies have shown that many doves — up to 25% of those shot — are not retrieved. The reality of hunting this bird could result in impractical and unethical sport hunting practices, such as leaving an injured bird to die. Mourning Doves also often mate for life, so when a mate is killed, the breeding pair is lost. Appropriate to their name, surviving Mourning Doves have been observed tending to their fallen mates. We believe responsible wildlife management and conservation practices require sound ethical considerations. Michigan Audubon encourages legislators and residents to continue supporting the Mourning Dove’s protection in Michigan, which has allowed us to enjoy and benefit from this bird and its balanced population in our state for over a hundred years.